Our new Glass Hardware collection gives you numerous options for installing our VividGlass and BermanGlass products. 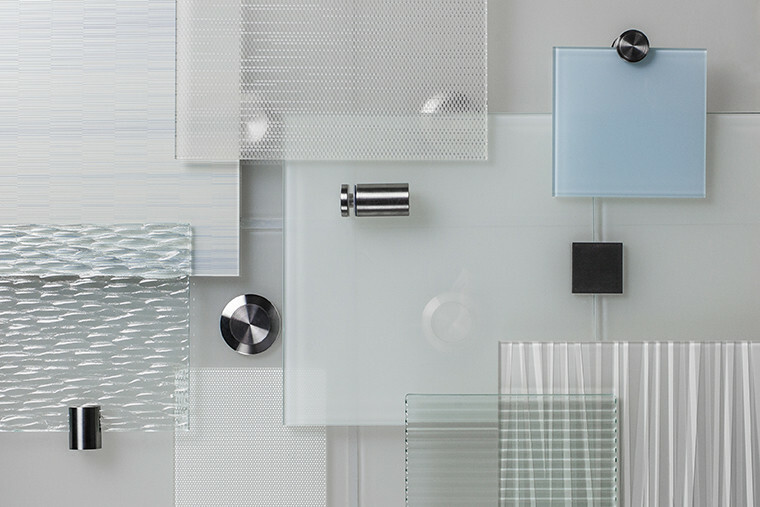 The different components, all intended for interior use, make it easy to address a wide range of vertical and horizontal glass applications and align with project-specific design themes. Slot Mount Standoffs are for mounting glass vertically or horizontally in a wide range of interior applications, including partition panels, signage and accent pieces. Available in five finishes for three glass thicknesses. Edge Grip Standoffs are designed for mounting glass to interior walls or other vertical substrates. Available in five finishes for three glass thicknesses. Round Standoffs are comprised of a cap and base. Bases come in eight lengths to accommodate different interior applications such as displays, furniture, signage, or accent elements. Available in six finishes for three glass thicknesses. Square Mall Clamps can be used for joining interior vertical lites of glass. They provide rigidity and reduce flexing and can also serve as floating indicators to alert pedestrians to a panel’s presence. Available in three finishes for a range of glass thicknesses. Spider Fittings are designed for mounting glass to walls, posts, fins, and other interior structural substrates with minimal visible connections. Available in 1-, 2-, 3-, and 4-arm configurations in two finishes for a range of glass thicknesses. configured to coordinate with F+S Glass Doors. Available in six finishes for two different glass thicknesses.